You already know that maintaining good oral hygiene is important for everyone — but when you're having orthodontic treatment, it's even more critical. Why? 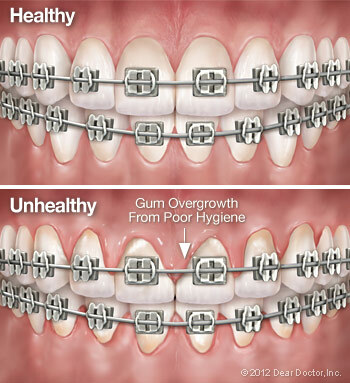 Because, while the appliances (such as braces) you may need to wear during treatment are very effective in correcting misaligned teeth, they can also trap food particles easily. Keeping your teeth (and your appliances) clean is a little harder — but you can do it! Here's a look at why good oral hygiene is so important during orthodontic treatment, and some tips on how you can keep it up. Either a soft-bristle or a bi-level toothbrush (one with longer bristles on the edges and shorter ones in the middle) can be effective in plaque removal — even with braces. An electric toothbrush can also be used, on a moderate setting. For hard-to-clean areas, try an interdental brush, or Proxybrush. The small bristles of this special tooth-cleaning aid, which is shaped like a pipe cleaner, can get in between wires, brackets and teeth. With gentle and persistent effort, it's possible to reach into the smallest nooks and crannies, and control plaque buildup.